This cap is made of soft cotton velvet. Measures 11" across and fits head sizes up to 7-1/2". Feather sold separately. Dry clean recommended. 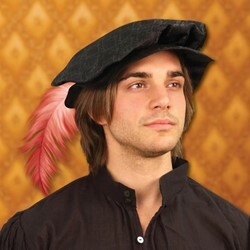 Designed for both youth and adults, this soft black Squire’s Cap is a nice addition to any costume wardrobe. This cotton velvet slouch hat is great for both lads and lasses to wear with outfits ranging from Medieval to Renaissance, artist to squire and page boy. Measures 11" across and fits head sizes up to 7-1/2". Feather sold separately. Squire's cap is a win.